Last January, I crocheted some samples for the Kollabora booth at Vogue Knitting Live. One was this shawl. Kollabora was looking for something that really stood out in the booth, and I held two strands of yarn together – a metallic and a mohair yarn. I’m really excited to be able to share the pattern for A Little Bit of Bling Shawl with you today. It’s a great project for the last days of summer – it’s quick and airy, but the long fringes provide good coverage in case it gets chilly. 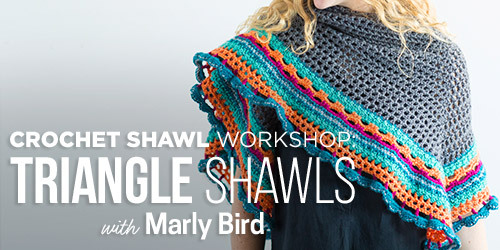 This quick and easy triangular shawl makes a great transitional weather accessory. The metallic yarn brightens up any outfit! Adjust the length of the fringe to fit your personal style. Finished Size: Adjustable. Photographed sample is 50” (127 cm) wingspan length, 13.5” (34 cm) spine length, excluding fringe. Galler Yarns Kismet (87% polyester/13% nylon, 8 oz/227 g/1,400 yds/1,280 m) – 1 cone in 901 Silver, or approximately 300 yds (274 m) in any metallic, light weight yarn. Galler Yarns Flore II (75% Kid Mohair/15% Wool/10% Nylon, 1.75 oz/50 g/100 yds/91 m/) – 3 skeins in 1005 Ocean, or approximately 300 yds (274 m) in any light weight mohair blend yarn. L-11/8 mm crochet hook, or any size needed to obtain correct gauge. Gauge: 10 fdc = 4” (10 cm) across. Exact gauge is not critical for this project. beg fdc – beginning foundation double crochet – Ch 4, turn, sk 3 sts, yo, insert hook in next ch, yo and draw up a loop, yo and pull through 1 loop (counts as ch 1), [yo and draw through 2 loops] twice. fdc – foundation double crochet – Yo, insert hook in ch 1 from previous st, yo and draw up a loop, yo and pull through 1 loop (counts as ch 1), [yo and draw through 2 loops] twice. Entire shawl is crocheted holding one strand of ea yarn together. Shawl is worked from top (long) edge with steady decreases to point. Row 2: Turn, *ch 5, sc in next ch-5 sp; rep from * across. Rep Rows 3 & 4 until 2 ch-5 sp remain, ending after Row 4. For each fringe, hold one strand of each yarn together and cut strands to 40” (100 cm). To attach fringe using crochet hook, insert hook into st or sp indicated below. With fringe strands folded in half, insert hook into fold (center) of strands, pull up a loose loop in st or sp. Yo with both halves of the fringe strands and pull through the loop. Tighten loop to hold fringe in place. Starting from top corner, use crochet hook to join fringe to third ch of first ch-5 sp. Working across angled edge, *sk next ch-5 sp, join fringe in next ch-5 sp; rep from * across edge until 2 ch-5 sp before center point. Attach 2 strands of fringe (2 strands of ea yarn/4 strands of yarn) to center point, sk next ch-5 sp, rep from * along edge. Trim fringe as necessary. © 2014 by Marie Segares (Underground Crafter). This pattern is for personal use only. You may use it to make unlimited items for yourself, for charity, or to give as gifts. You may sell items you personally make by hand from this pattern. Do not violate Marie’s copyright by distributing this pattern or the photos in any form, including but not limited to scanning, photocopying, emailing, or posting on a website or internet discussion group. If you want to share the pattern, point your friends to this link: http://undergroundcrafter.com/blog/2014/09/01/free-pattern-a-little-bit-of-bling-shawl. Thanks for supporting indie designers! Lovely and fun! and one could intensify with more fringe. So fun to glimpse the park. I miss New York, my hometown. Thanks for sharing! Thanks for stopping by, Akua! You could definitely pump this one up with fringe. Truly, A Beautiful Shaw! Happy I Magically Came Across Your Web Site. Being a new crocheter, how and what do I do to make it a rectangle scarf? Most Appreciative! Well, Thank You Very Much for the link! Considerate of you. I will work on the “Little Bit Of Bling Shawl”. It’s too pretty to pass up! Thanks for the kinds words, Ms. Belinda Janet Osborne. beautiful shawl and love that yarn! thanks for sharing the pattern with us! Thanks, Millie! Sadly, both yarns are now discontinued :(.